Nonoperative management (NOM) of gunshot liver injuries (GLI) is infrequently practiced. The aim of this study was to assess the safety of selective NOM of GLI. A prospective, protocol-driven study, which included patients with GLI admitted to a level 1 trauma center, was conducted over a 52-month period. Stable patients without peritonism or sustained hypotension with right-sided thoracoabdominal (RTA) and right upper quadrant (RUQ), penetrating wounds with or without localized RUQ tenderness, underwent contrasted abdominal CT scan to determine the trajectory and organ injury. Patients with established liver and/or kidney injuries, without the evidence of hollow viscus injury, were observed with serial clinical examinations. 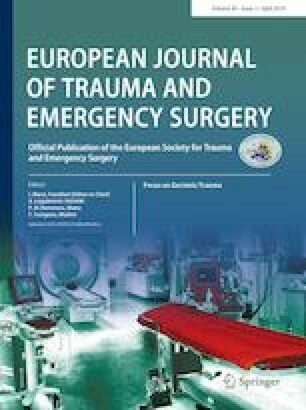 Outcome parameters included the need for delayed laparotomy, complications, the length of hospital stay and survival. During the study period, 54 (28.3%) patients of a cohort of 191 patients with GLI were selected for NOM of hemodynamic stability, the absence of peritonism and CT imaging. The average Revised Trauma Score (RTS) and Injury Severity Score (ISS) were 7.841 and 25 (range 4–50), respectively. 21 (39%) patients had simple (Grades I and II) and 33 (61%) patients sustained complex (Grades III to V) liver injuries. Accompanying injuries included 12 (22.2%) kidney, 43 (79.6%) diaphragm, 20 (37.0%) pulmonary contusion, 38 (70.4%) hemothoraces, and 24 (44.4%) rib fractures. Three patients required delayed laparotomy resulting in an overall success of NOM of 94.4%. Complications included: liver abscess (1), biliary fistula (5), intrahepatic A-V fistula (1) and hospital-acquired pneumonia (3). The overall median hospital stay was 6 (IQR 4–11) days, with no deaths. The NOM of carefully selected patients with GLI is safe and associated with minimal morbidity. Drs. Pradeep Navsaria, Andrew Nicol, Jake Krige, Sorin Edu and Sharfuddin Chowdhury declare that they have no conflict of interest. The study has been approved by the institutional ethics committee and has been performed in accordance with the ethical standards as laid down in the 1964 Declaration of Helsinki and its later amendments or comparable ethical standards: University of Cape Town Human Research Ethics Committee approved study: 048/2007. This was a retrospective review of prospectively collected data (observational study); therefore, no consent was taken. The patients were managed according to standard Unit protocols. All data were collected by the first author on a password-protected computer and Excel sheet. None of the patients could be identified in the database as they were numbered consecutively from 1 to 278. The privacy and confidentiality interests of participants were preserved. No information can identify individuals.